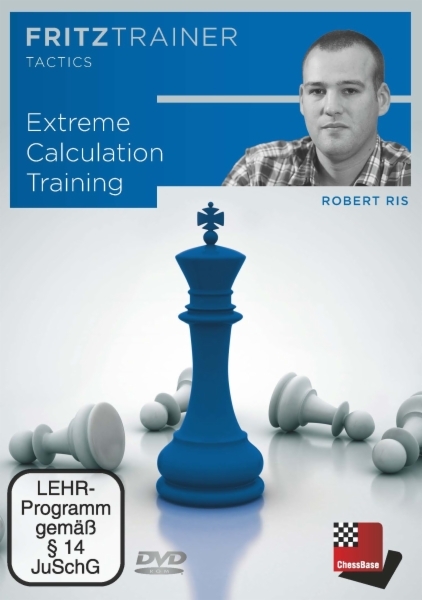 After the success of the first volume on Calculation Training, Dutch IM Robert Ris continues with “Extreme Calculation Training” — a wide range of new aspects which have to be mastered to become a great calculator at the board! The topics discussed in the original series (candidate moves, method of elimination & imagination) are certainly useful when studying the content of this new video series. Special attention will be paid to intermediate moves, quiet moves, sacrifices on empty squares, mating patterns, ignoring opponent threats, calculation in defence and methods of comparison. On top of that, more practical advice for training is recommended, for instance how to handle your time management and how to visualise the position in your mind during the calculation process. After going through the 13 examples from the theoretical section, it’s time to switch the brain to active participation and your calculation skills will be tested seriously! The frequent request for more puzzles has been granted, as Ris has selected no less than 50 games with multiple questions. After all, training your calculation abilities is an activity which never ends; it takes continual practise to stay sharp at the board!